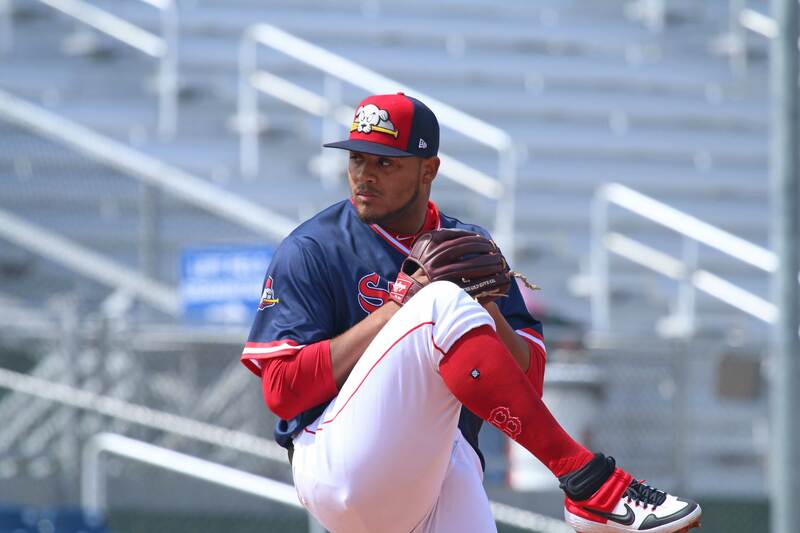 Darwinzon Hernandez struck out ten Reading batters in only five innings. 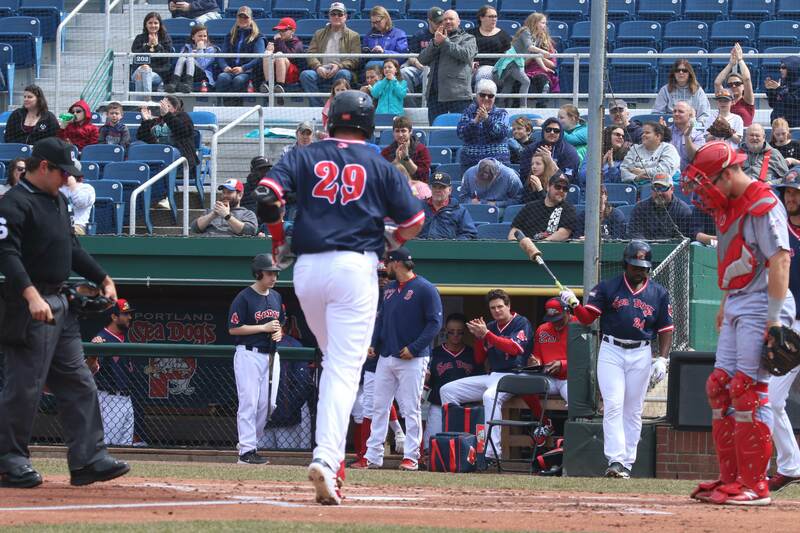 (Portland ME) The Portland Sea Dogs broke into the win column this afternoon defeating the Reading Fightin Phils, 6-0. Winning pitcher Darwinzon Hernandez (1-0) struck out the side in the first inning and had ten K’s before he was finished after five innings. 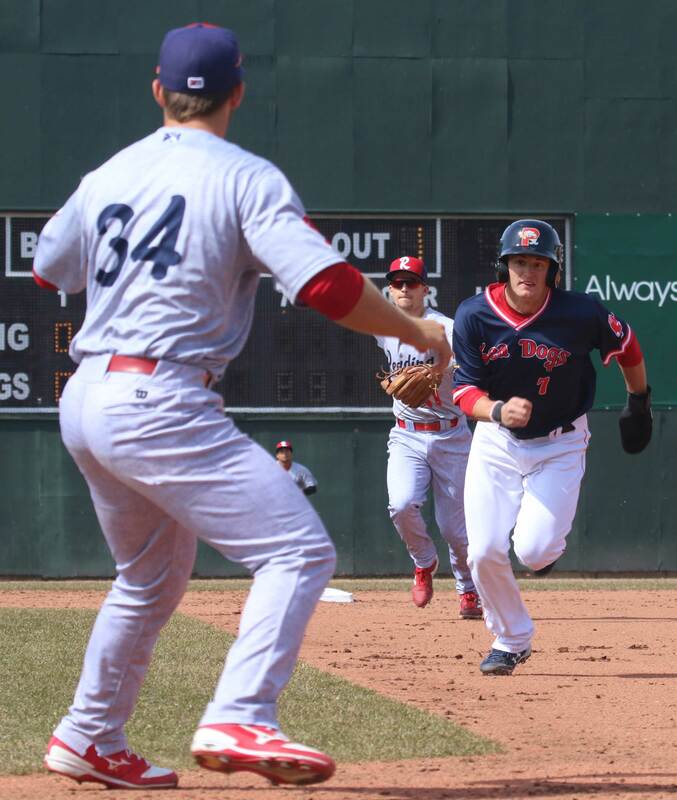 Bobby Dalbec and Jantzen Witte were the hitting stars for Portland with nearly duplicate stats: three hits including a home run, two RBI, and two runs scored. 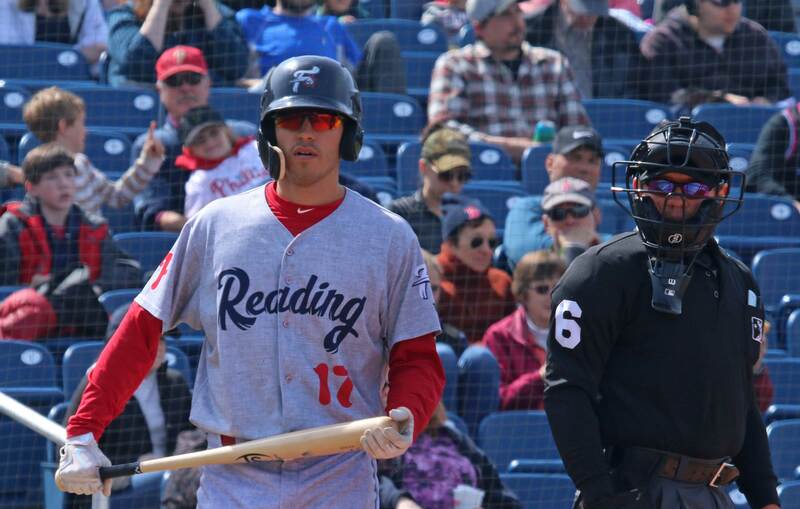 Reading (3-1) featured three former first-round picks: Cornelius Randolph (2015), Mickey Moniak (2016), and Adam Haseley (2017). Mickey and Adam were in action today. Both struggled to make contact…….Mickey (4 K’s), Adam (3 K’s). The weather was extremely cooperative for early April in Maine; temperatures in the high 50’s with no wind. Chris Cameron told me pre-game that tomorrow (Monday) 1”-2” of snow is expected. Now that’s more like it! 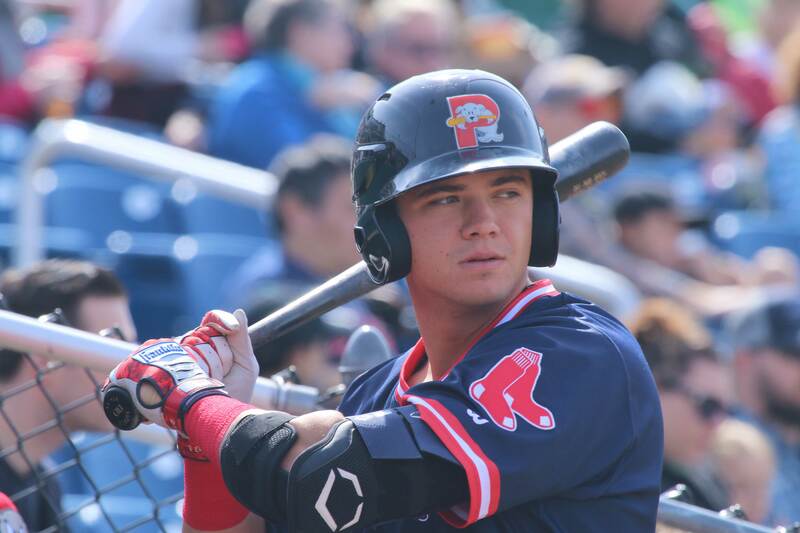 Portland (1-3) is a quick drive for me from Amesbury (MA) and I enjoy getting looks at the future stars of the Red Sox. You can never be certain of who those stars will be. 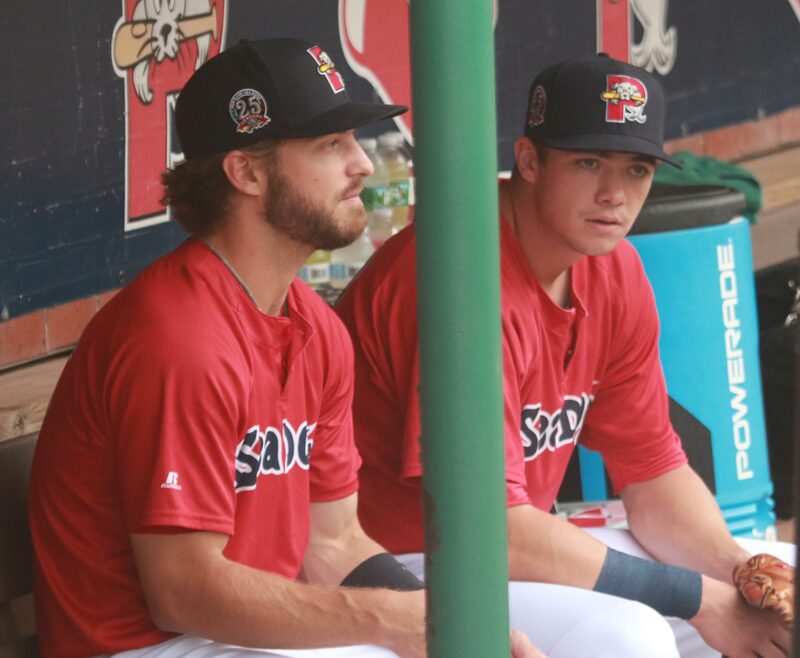 I have pictures of Jackie Bradley and Travis Shaw when they were in Portland, but they weren’t highly touted in Double A.
Bobby Dalbec is, however, highly regarded by the Red Sox and I saw him reach Portland at the end of last season. 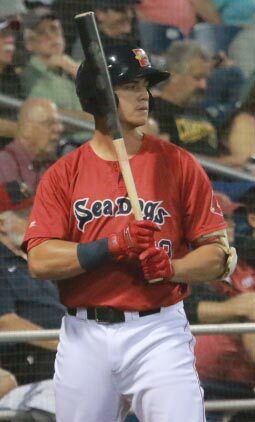 How long the power hitter will last at Portland is part of why I took an early run to Hadlock Field to see him while I could. In today’s game Bobby ripped a homer over the left-field fence. 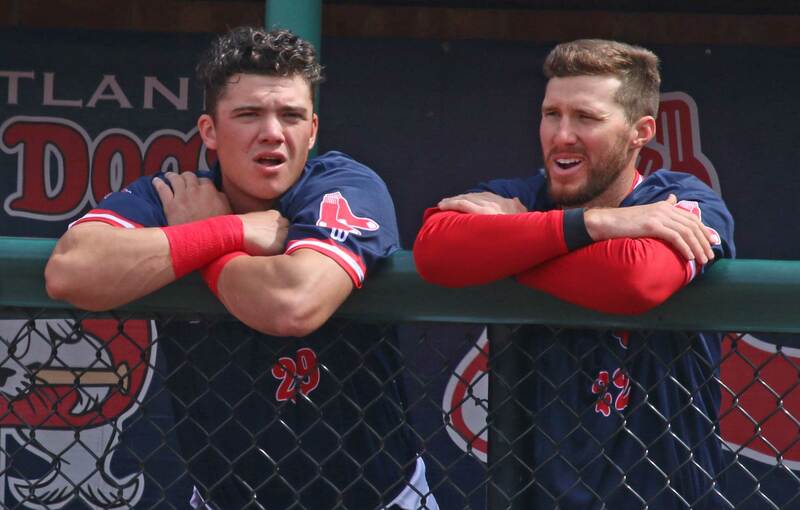 Playing third probably won’t get Bobby to the majors with Rafael Devers locked in there. I’m thinking that first base would be a better spot for him. 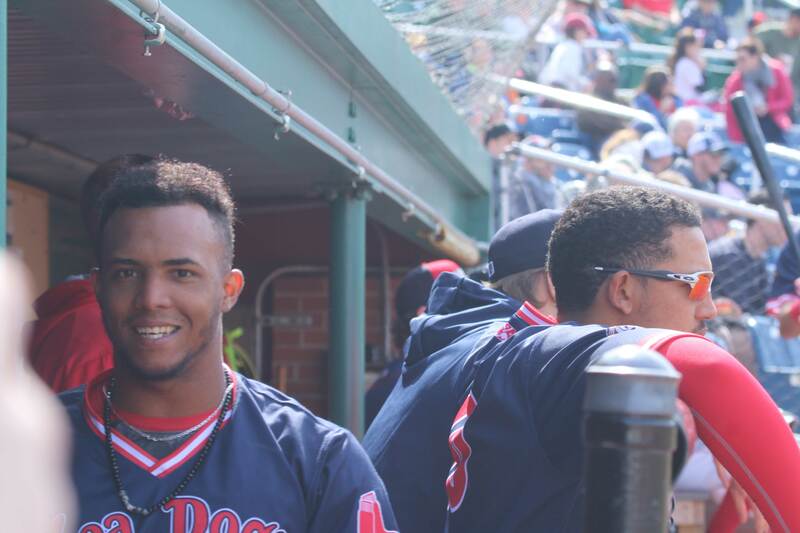 Darwinzon Hernandez was signed by Boston in 2013 when he was 16-years-old. From Venezuela, the left missed plenty of bats in his overpowering, 2-hit, afternoon. 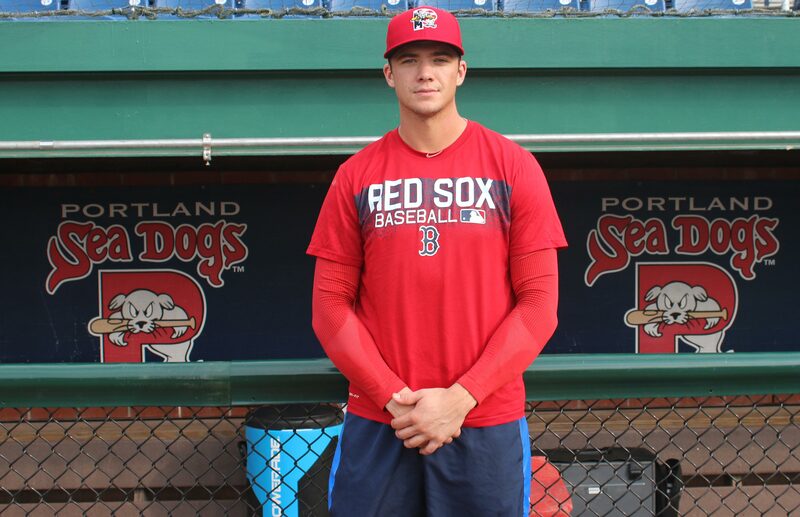 Darwinzon could well be the first one off the Portland roster and onto the Pawtucket roster. 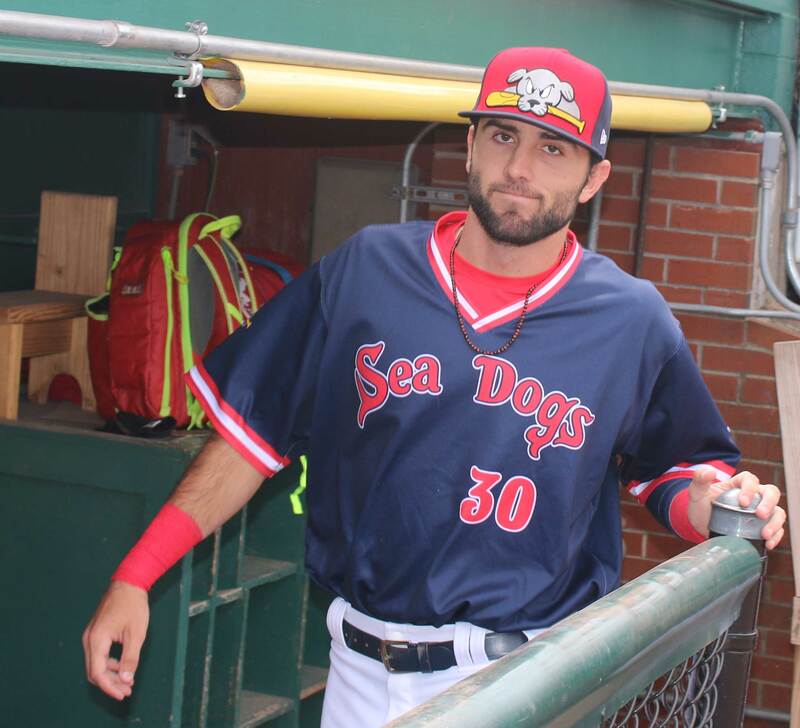 Newcomer CJ Chatham was the Sea Dogs shortstop. He and Bobby Dalbec were both chosen by Boston in 2016. I was definitely interested in getting pictures of the Phillies first-round picks. Outfielder Mickey Moniak was actually the first pick in the entire draft in 2016. He’s only twenty so there is plenty of time for him to move up in the Philadelphia system. I love the atmosphere at Hadlock. I think it’s because so many families show up. You see kids with gloves, excited to be where “real” baseball is going on. And there’s also family-friendly entertainment between every inning. 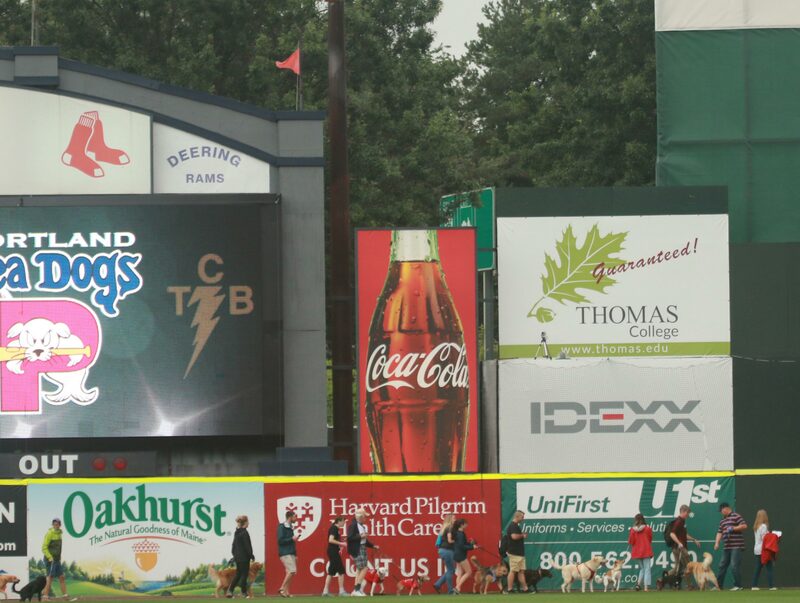 The between-inning contests often involve youngsters and are skillfully handled by the Sea Dogs staff. 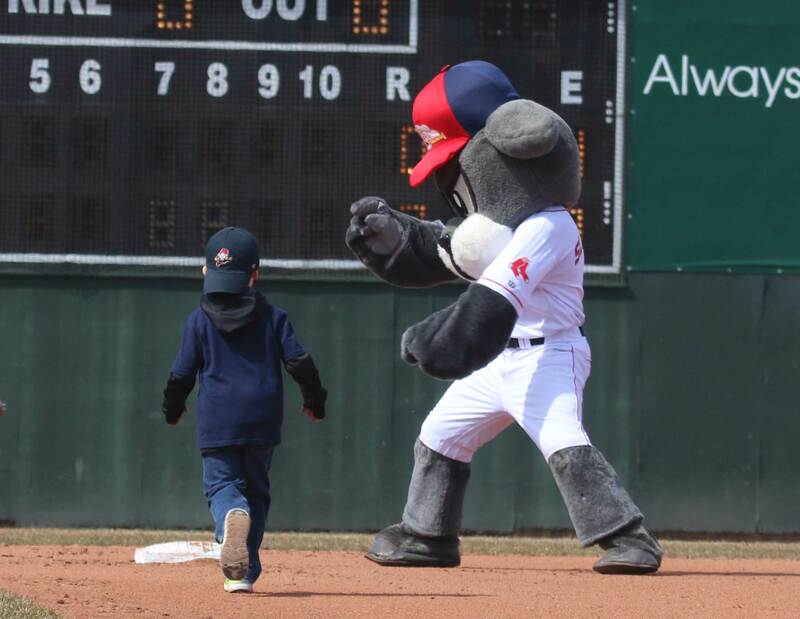 A key piece of entertainment for me will always be Slugger’s race around the bases against a young fan. I may be the only one that still believes that the big guy will win. Today’s race was yet another disappointing one. I had seen the promos of Slugger in the off-season. I saw him doing back flips and splits and assumed that he was ready to get a win. Today I thought that Slugger was way too kind to his young opponent. How so? 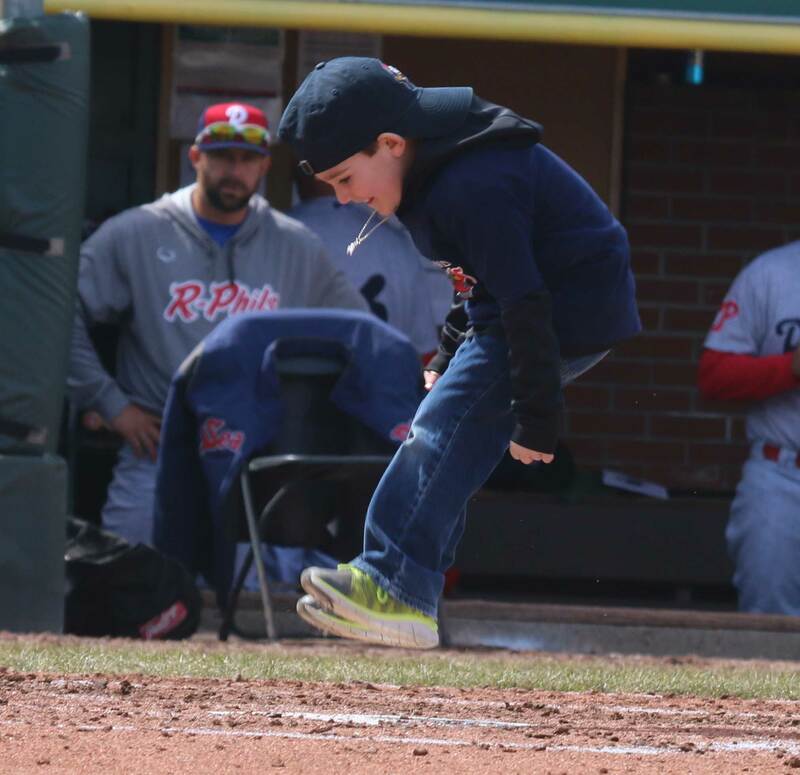 The youngster thought that the race ended at first base. Instead of taking advantage, the big guy waited, giving the kid a chance to get guidance. 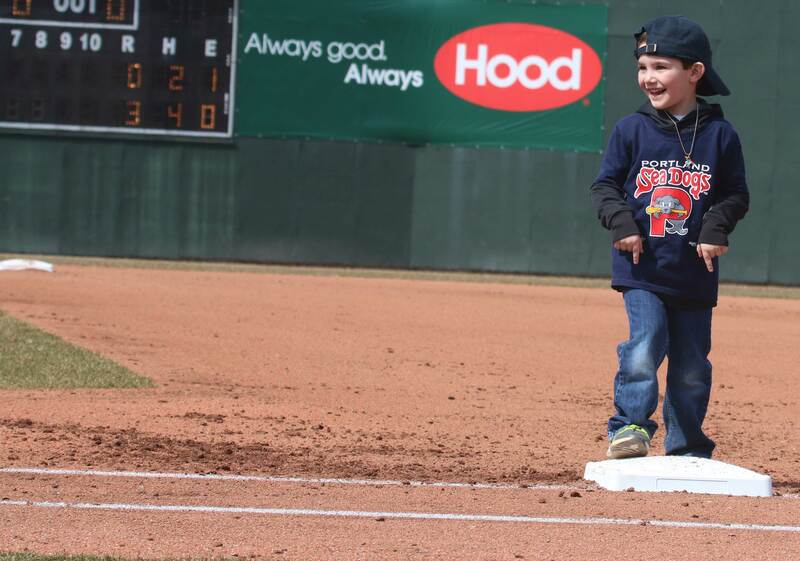 Then when they met at second, Slugger pointed to where the kid should run next! All this helping turned today’s race into a last-base event and Slugger looked as if he was in great position to end the losing streak. But then his lack of practice running did him in. Slugger rounded first, heading home, and suddenly lurched into a bent-over stop. I thought he might lose his lunch. 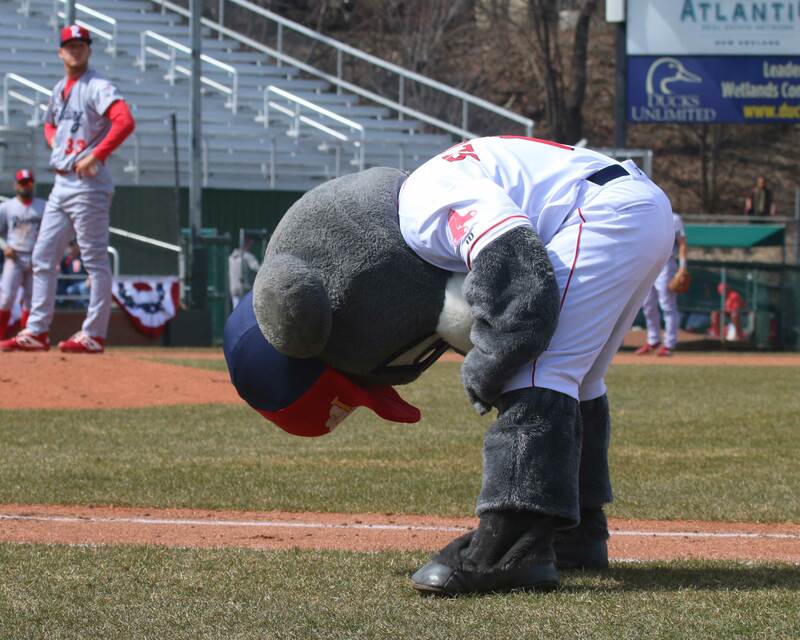 While Slugger’s digestive disaster happened, his opponent leaped onto home place, the winner. 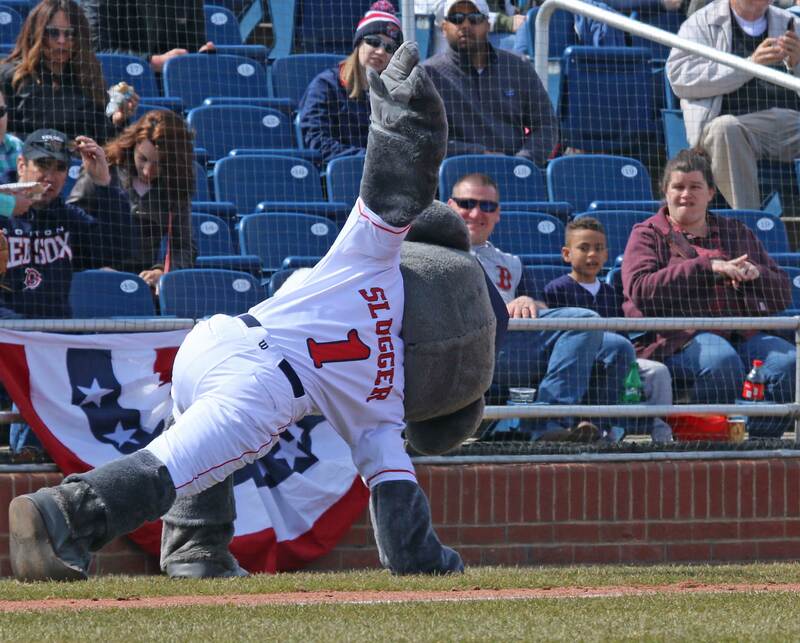 My assumption that Slugger was in running shape was obviously misguided. It’s a long season and maybe he’ll get his second wind or at least lighten up on the pre-race food intake. It must have happened on the recommendation of a photographer: both teams had numbers on the front of their uniforms as well as the backs. Everyday photographers know the players by their faces. The rest of us don’t. I spoke with two people I follow on Twitter; Kevin Thomas (Portland Press Herald) and Kelley O’Connor (minor-league photographer). 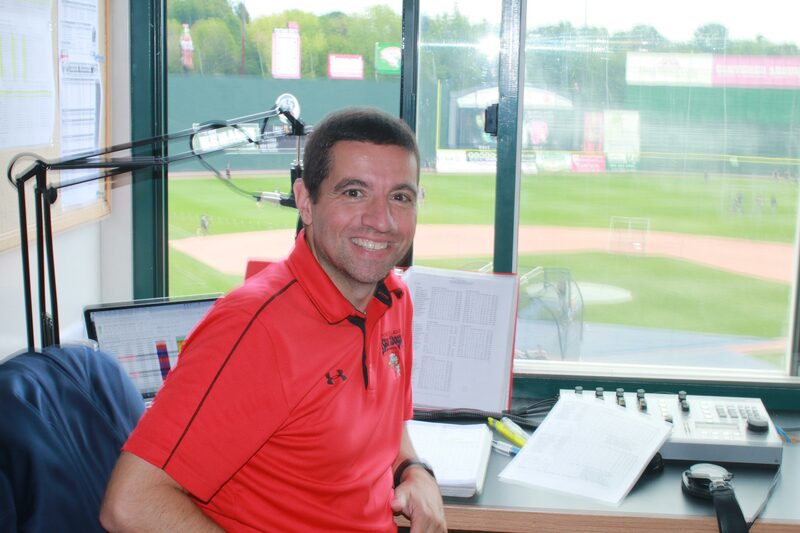 I highly recommend a visit to Hadlock. Affordable with an early viewing of some possible future major leaguers. Thanks, as always, to Chris Cameron for arranging my visit. 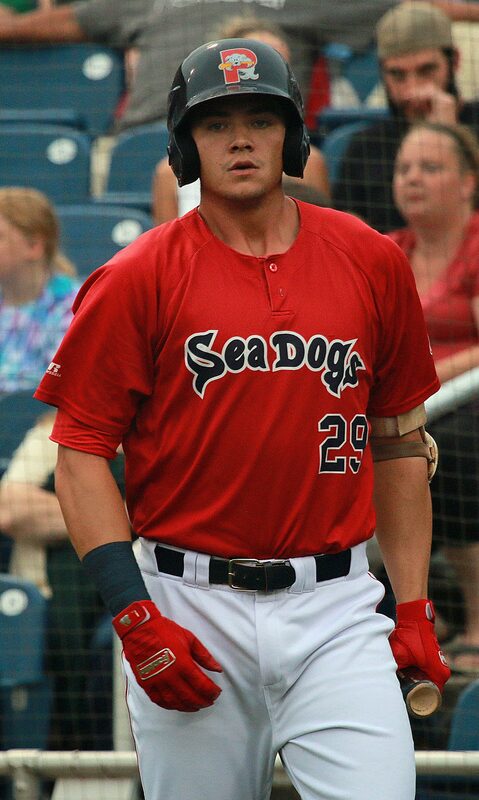 Bobby Dalbec ready to hit. (Portland ME) Sometimes batters get your attention in batting practice. 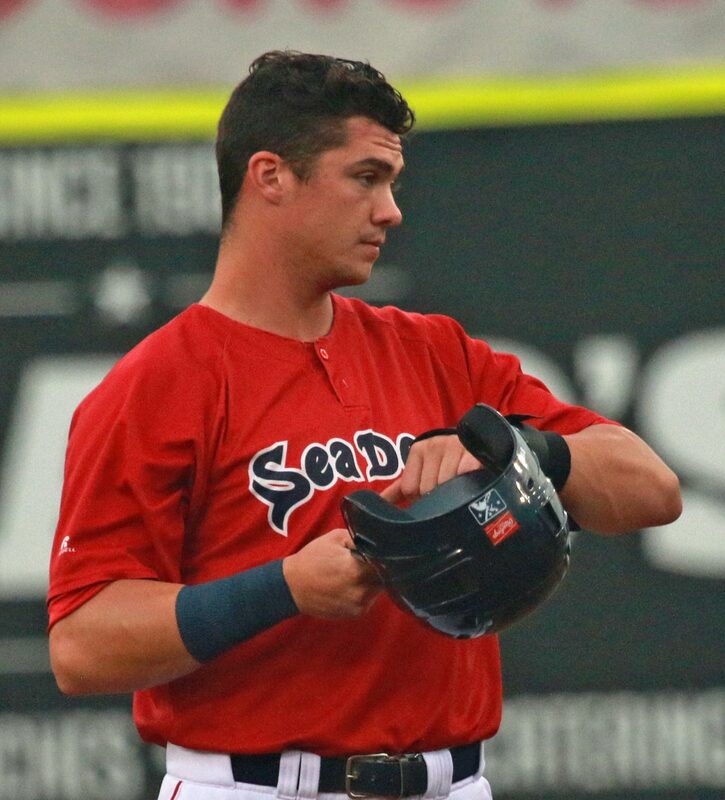 Bobby Dalbec of the Portland Sea Dogs is one of those players. Thirteen games into the 23-year-olds promotion to Double A, he bears watching even before the game. 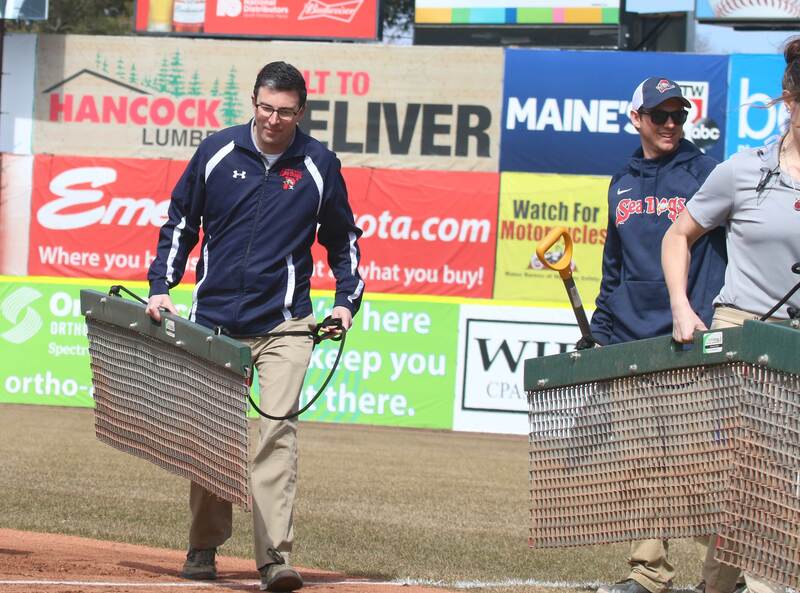 I took in the pregame yesterday at Hadlock Stadium and saw him drill BP pitches all over the place. During BP the Altoona Curve was warming up in the left-field corner awaiting their turn to take over the field. I’d hear the whack of bat meeting ball and watch players at least 300 feet away take a quick look to see if the ball was coming their way. And several times it did. 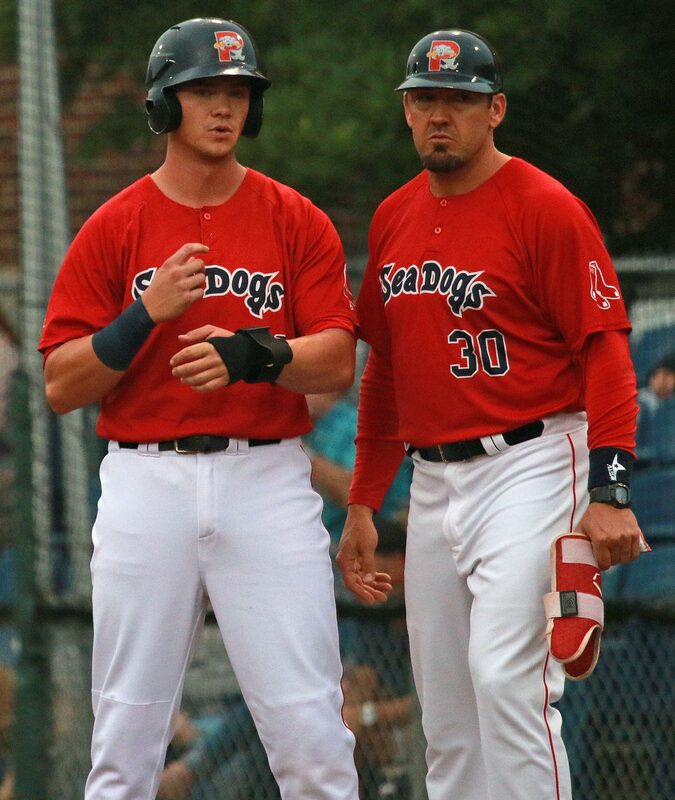 I watched one of the Sea Dogs coaches, standing near second base, hear a ball go whizzing by his head and not have time to react. The young man has power. 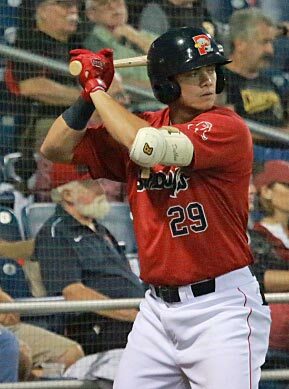 Between Salem (VA) in the Carolina League and his brief time in Portland, Bobby is tied for the top spot in the minors with 31 home runs. Bobbly was one of the Portland players without a number on his practice jersey. “That gives you away as the new guy,” I kidded him. Bobby told him that his parents were in Portland for the weekend to see him play here for the first time. They had taken two trips to Salem to catch him in the Carolina League. 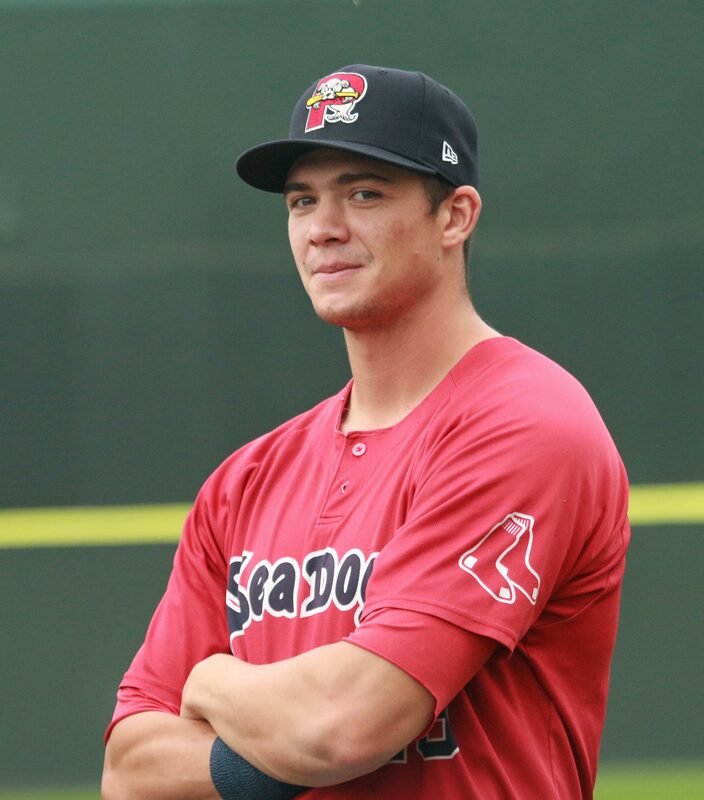 Bobby is a third baseman but so is Boston’s #1 prospect Michael Chavis. In tonight’s game Michael was at 3B and Bobby was DH. There is so much data available on players that with his reputation he faced shifts even in A ball. “I was aware of the shifts, but I just refused to change my approach at the plate to try and defeat it,” said Bobby. Mike told me that he was surprised that the righthanded-hitting Bobby was seeing a lot more fastballs early in counts since teams were shifting a bit toward the left side. 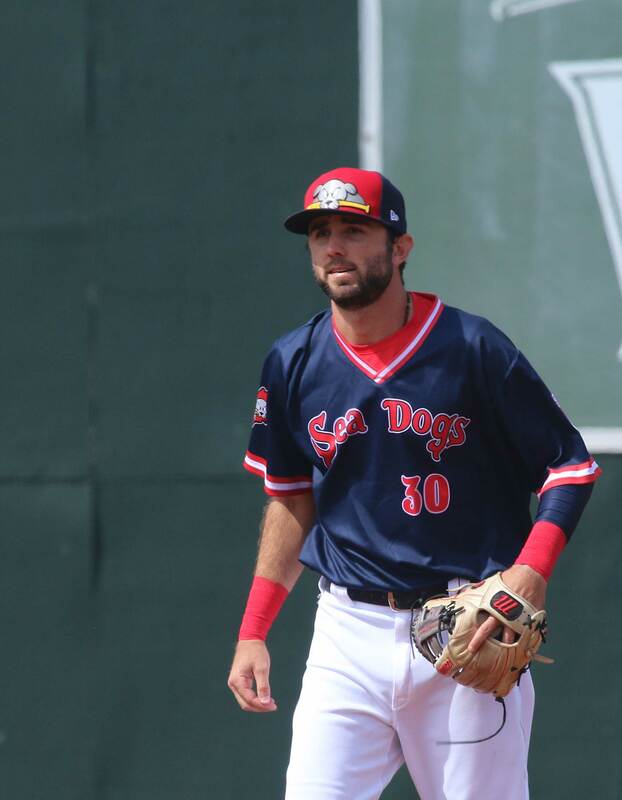 Regarding his future Bobby said: “I’m just going to keep doing what I’ve been doing and see where it takes me.” So far it has taken him this season from Boston’s #12 prospect to #6. Red Sox 3B Rafael Devers may be younger (21) and entrenched a bit in Boston but Bobby’s power numbers and ability to play the position could move him up to Fenway sooner or later. 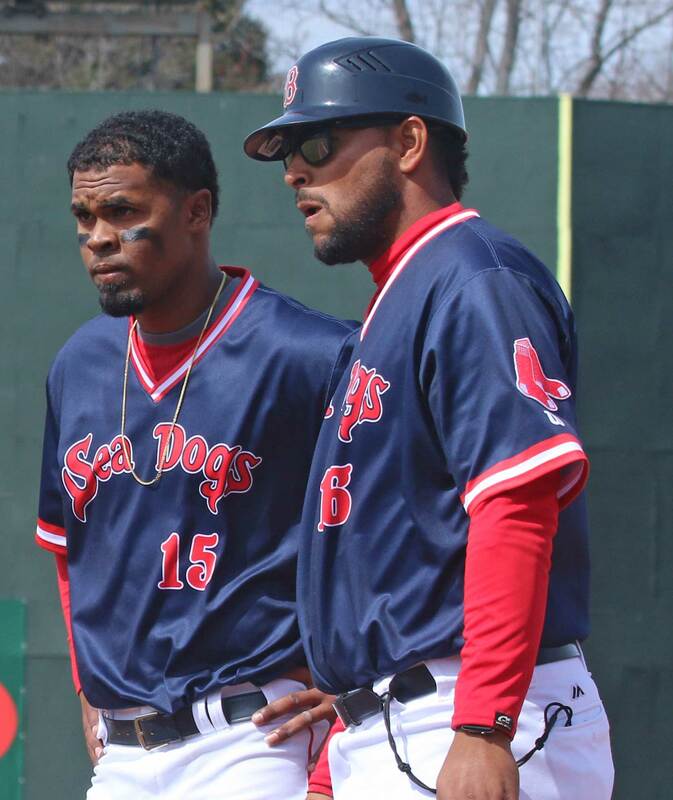 One is left to wonder how the last-place Portland Sea Dogs (52-69) would have done in 2018 with Josh Ockimey, Michael Chavis, and Bobby Dalbec in action from the beginning of the season. My thanks to Mike for arranging my interview with Bobby Dalbec and adding to the information I had on the talented young man.